1. 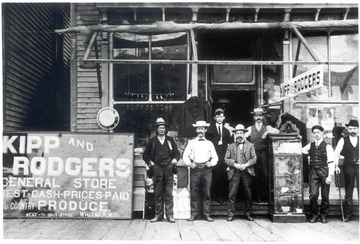 Customers and Employees in front of Kipp and Rodgers General Store in Whitmer, W. Va.
Customers and Employees in front of Kipp and Rodgers General Store in Whitmer, W. Va.
Two dogs harnessed to coal carts. 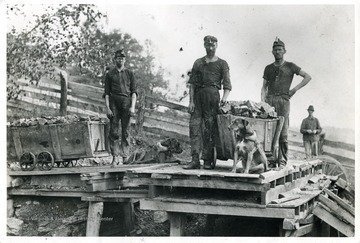 About 1890, Ohio Coal Mine. 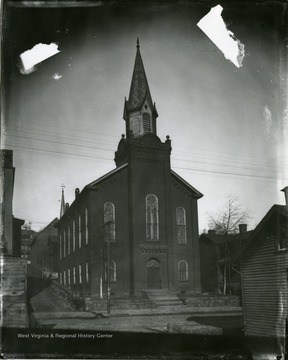 This photograph is the property of Pittsburgh Consolidation Coal Co. 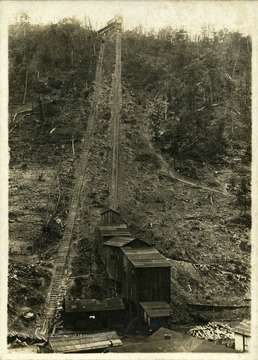 Tracks going up mountain at Besoco, W. Va.
5. 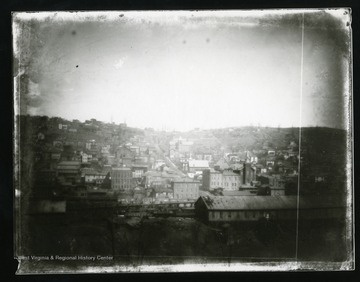 Panoramic View of Charleston, W. Va.
Panoramic View of Charleston, W. Va.
View of Charleston, West Virginia in 1890. 6. Grafton Bank in the McGraw Building, Grafton, W. Va.
Grafton Bank in the McGraw Building, Grafton, W. Va. Exterior of the McGraw Building in Grafton, W. Va. 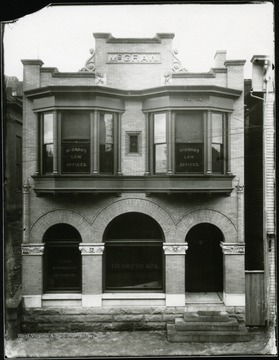 The Grafton Bank occupies the lower level, while McGraw's Law Offices are upstairs. 7. 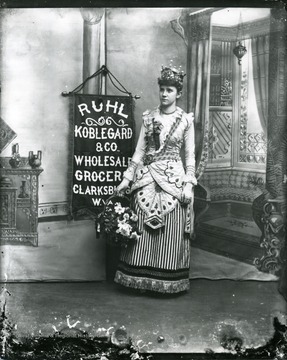 Ruhl Koblegard and Co. Wholesale Grocery Girl, Clarksburg, W. Va.
Ruhl Koblegard and Co. Wholesale Grocery Girl, Clarksburg, W. Va.
Advertisement for Ruhl Koblegard and Co. Wholesale Grocery, in Clarksburg, West Virginia, featuring a girl wearing an ornate dress and holding a basket of flowers. 8. 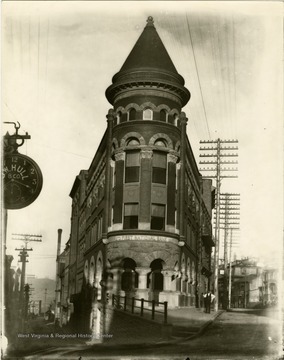 First National Bank, Grafton, W. Va.
First National Bank, Grafton, W. Va.
View of the entrance and tower of the First National Bank in Grafton, West Virginia. 9. Andrew's Methodist Episcopal Church, Grafton, W. Va.
Andrew's Methodist Episcopal Church, Grafton, W. Va.
View of the front of Andrew's Methodist Episcopal Church, now the International Mother's Day Shrine, in Grafton, West Virginia. 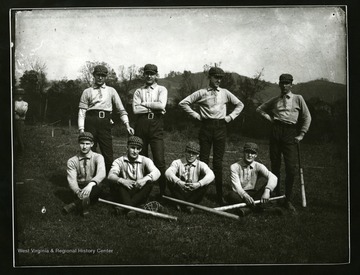 Baseball team members pose for a group portrait. 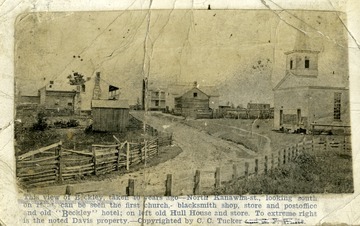 A view homes and businesses in Grafton, West Virginia around 1890. 12. Elementary School Class in Grafton, W. Va. 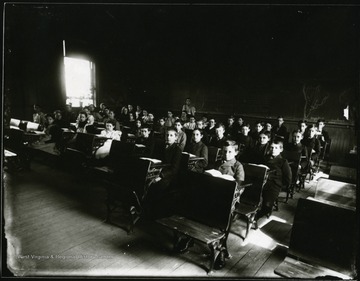 Elementary School Class in Grafton, W. Va.
Students seated at their desks, teacher standing at the back of the classroom.